Laikipia County, ca. 9,700 km², probably holds the highest diversity of larger mammal species of any region of its size in the world. Most of Laikipia County is covered by the Laikipia Plateau (ca. 1,600–2,400 m asl), an area composed of a mix of flat ground, undulating plains, rolling hills, steep hills, and scattered granitic inselbergs (or ’kopjes’). 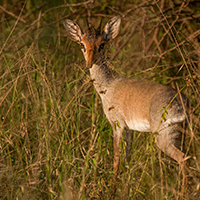 Living in some of the hottest, driest and most thorny habitats of Africa, Günther’s dik-dik Madoqua guentheri occur over much of central and northern Kenya, northern Uganda, southeast South-Sudan, south and southeast Ethiopia, and most of Somalia. Laikipia’s smallest antelope (ca. 4.5 kg) occupies all of the bushlands of Lolldaiga Hills Ranch (1700-2200 m asl). Lolldaiga Hills Ranch lies at the southern limit of this antelope in central Kenya. Wondering what an African palm civet sounds like? 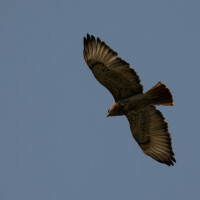 We are posting bird and mammals sounds on wildsolutions.nl! The African palm civet, or two-spotted palm civet, (Nandinia binotata) is a small (2 kg), nocturnal, arboreal, solitary predator, and the only species in the family Nandiniidae. The species is endemic to Africa. The African palm civet occurs from Gambia across the Congo Basin to north Angola, south Kenya, northwest Mozambique and east Zimbabwe (you find the IUCN map here). The African palm civet has an olive-brown body with dark spots and a long bushy tail. This species lives in deciduous forests, rainforests, riverine forests and montane forests from sea level to 2500 m. The African palm civet is predominantly frugivorous but opportunistically feeds on small animals. African palm civet (Nandinia binotata) at Ntem, south Cameroon. Photograph by Yvonne de Jong & Tom Butynski. The African palm civet can be locally abundant. Because it is nocturnal and arboreal, this species is not easy to see. 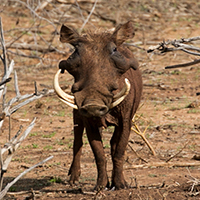 Dominant males and neighbouring females communicate by loud ‘hou’ calls that can be heard up to 1 km away. 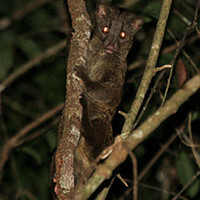 During primate surveys, members of the Nocturnal Primate Research Group at Oxford Brookes University (UK) recorded the calls of African palm civets, as well as of other mammals and birds. 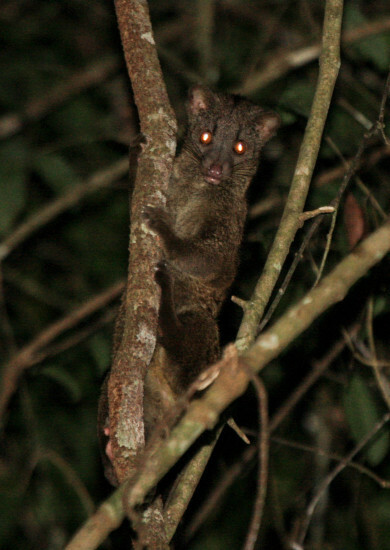 On this page we have posted the ‘hou’ call of the African palm civet. We will, gradually, add the calls of other species. Click here to listen to the African palm civet and other species! 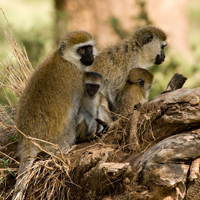 Baboons (genus name: Papio; Kiswahili: nyani) are the most widespread of Africa’s monkeys. 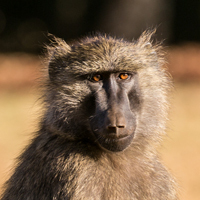 Occupying most of Africa south of the Sahara, baboons inhabit almost all types of vegetation. It is not difficult to find baboons on the beach of East Africa, in the Fynebos of South Africa, in semi-arid northern Kenya (see our earlier post: “Finding a New Monkey for East Africa”), in bamboo forest in Senegal, or in montane forest in Tanzania and Uganda.